Westover Building Supply is the commercial and residential contractors' single source for all the quality sheetrock products and services you need to complete your Springfield MA drywall projects on time and on budget. Our commitment begins where it matters most - at the local level. You can count on us to be the gypsum provider for all your wallboard project needs. Westover Building is the premier supplier of drywall, plaster, sheetrock, insulation, acoustical tile and grid, steel framing, gypsum and accessories for Springfield MA. 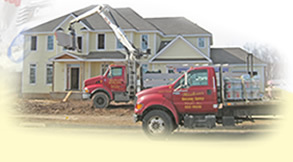 Westover Building offers services such as delivery, crane service and custom quotes. We are dedicated to providing our dry wall customers with convenient, one-stop shopping for all of their sheet rock and tool supply needs. We provide our Springfield MA customers with the best brand names in the industry and a knowledgeable, customer-friendly staff to assist them with all of their sheetrock purchasing and delivery needs. Serving the Springfield MA area for all their drywall - sheetrock - gypsum needs since 1962!